Home Global Equity Argentina’s Ebullient Stock Market Shrugs Off An Embarrassing Moment, But What Next? 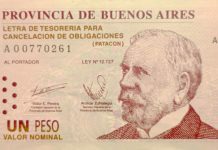 Argentina’s Ebullient Stock Market Shrugs Off An Embarrassing Moment, But What Next? 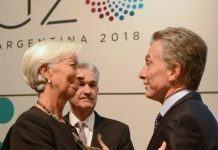 Though there is debate regarding the irreversibility and effectiveness of President Mauricio Macri’s economic reform policies, one aspect of Argentina is beyond dispute: the exuberance of its stock market. In Argentine peso terms, the Buenos Aires Stock Exchange Merval Index is up 30% in YTD 2017 until July 7. In USD terms, the rise is capped at 22% in the period due to the decline of the peso against the greenback. Meanwhile, the Global X MSCI Argentina ETF (ARGT) is up 27%. With this performance, it has far outperformed the previously best performing emerging market from Latin America – Mexico – represented in the graph above by the iShares MSCI Mexico Capped ETF (EWW). It has also given tough competition to the best performing emerging markets of this year so far – Poland (PLND) and Greece (GREK). What lies behind this performance? 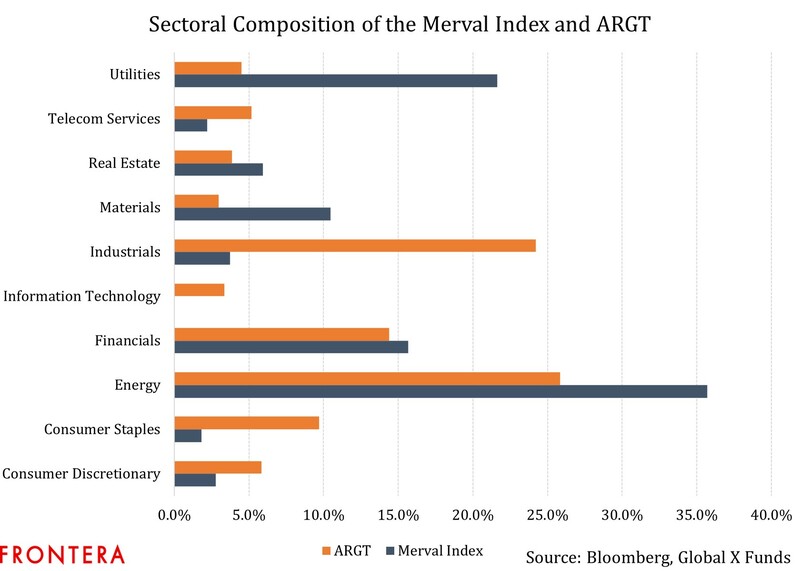 The graph below outlines the sectoral composition of the Merval and the ARGT. Apart from Argentine stocks, the latter also invests in American Depository Receipts listed on US exchanges. 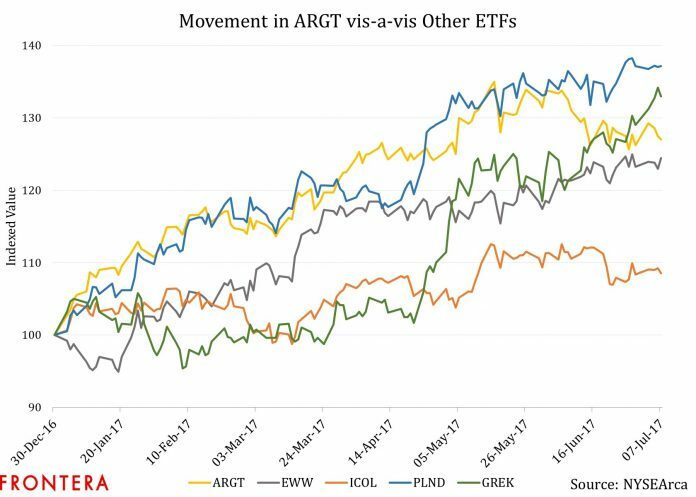 The difference between the returns of Merval (in USD terms) and ARGT in YTD 2017 is best displayed by the sectors contributing to their returns. The tech sector has been the biggest sectoral contributor to the ARGT, led by US-incorporated Mercadolibre, Inc. (MELI), although it does not form part of the Merval. The stock is by far the single-largest contributor to the ETF. Financials follow next, led up by ADRs of Grupo Financiero Galicia S.A. (GGAL) and Banco Macro S.A. (BMA). Given the plethora of reforms by the Macri government, there was widespread hope that Argentina would be included in MSCI’s Emerging Markets Index from June this year. 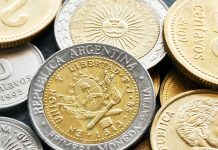 BlackRock had launched the iShares MSCI Argentina and Global Exposure ETF (AGT) with a view to this inclusion resulting in an appreciable upside for the country’s stocks. However, MSCI’s 2017 Market Classification Review, though positive for China and Saudi Arabia, caused somewhat of an embarrassment to Argentine equities as the country was left tagged with a frontier status yet again. Argentine stocks took the MSCI snub in stride though, rather than a sharp negative reaction. This year’s June review was arguably the closest the country has come to regaining its emerging market status since having lost it in May 2009. Stocks are undoubtedly expensive at this juncture compared to its Latin American peers and investors who have given Argentine equities a miss so far may need to wait until the political situation steadies next May – a consideration we’ll look closely at in the last article of this series. But before that, let’s look at a development which continues to attract market intrigue: the 100-year bond sale.